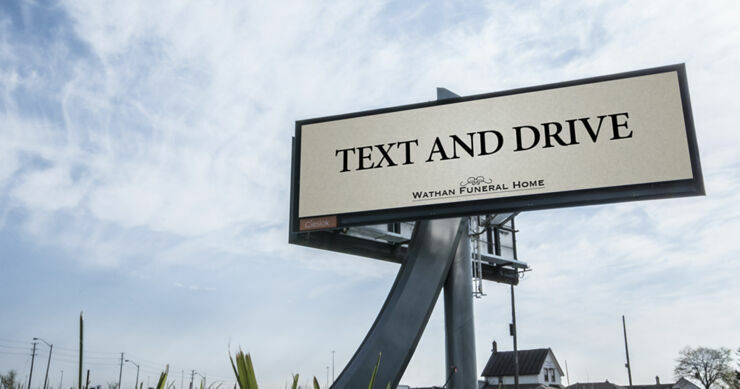 A billboard in Toronto is causing drivers to question the ethics of Wathan Funeral Home who proclaim in huge letters "Text and Drive." The idea is that the more people who text and drive the more people who will meet their end, and so is a way for the company to drum up new business. But, before you get morally outraged at such a nefarious tactic, the billboard is not all it seems. Because if you head to the Wathan Funeral Home website you will find that, as a business, it doesn't actually exist. Instead the billboard is part of a campaign by Canadian ad agency John St. and ad placement company Cieslok Media. If you click on the website you're greeted with the following message. But we're not a funeral home. We're just trying to get Canadians to stop texting and driving, which is projected to kill more people in Ontario this year than drinking and driving. That's right. More. And while most people wouldn't even think about drinking and driving, over half of Ontario drivers admit to reading texts while behind the wheel. That's more than half of the drivers on the road today risking their lives, their passengers’ lives and the lives of their fellow motorists and pedestrians. Cunning. It might be dastardly but it's certainly going to get people's attention. Just as long it doesn't divert too much of their attention away from the road.